It’s the evening after the remnants of Hurricane Gonzalez hit Britain – so near perfect football conditions for early winter football. Suprisingly apart from going on a half mile walk to actually find a point at which you can cross the River Don to get to this very impressive but totally inaptly named The New York Stadium – this is actually a very decent new ground that holds 12,000. Tonight’s pie is standard issue – from Pukka Pies – a steak and kidney offering. 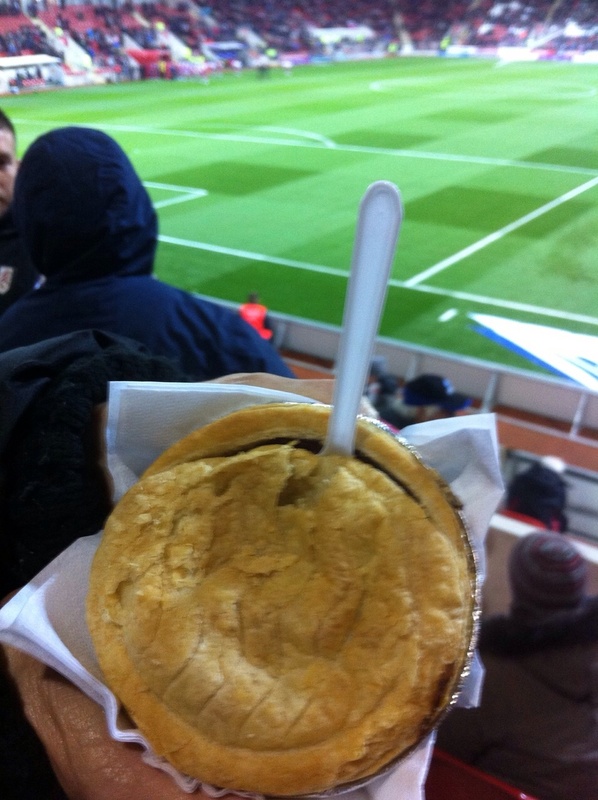 I’m impressed that one of the new stadium stands is named The Eric Twigg Pukka Pie West Stand. Thinking I might be at the Holy Grail home of Pukka Pies and that maybe Eric Twigg is the creator of Pukka pies and a Rotherham home lad, I am disappointed to discover Eric Twigg is a mere wholesaler and supplier of Pukka Pies and that they actually come from Leicester. So no trivial for storing for that pub quiz from tonight’s game. The pie – well you know what you are getting with a Pukka pie. They don’t come wrapped in plastic, they look like pies and they taste like a real pie. But there is always that lingering question why do all their pies always look pale an anaemic – a white pasty look – or with at best a light tan. There’s still flaky – just they don’t look as inviting to the eye. Contents same reliable and slightly spicy/tangy twist. Pastry chewy at the end. Ok but not really memorable and now becoming a bit predicable. Fortunately the Fulham performance with “Prima Donna” Bryan Ruiz rested put in a strong and gutsy performance and despite being behind come away with a hard earned 3-3 thanks to a 90 minute equalizer.